Overview: You will configure access for MAPI clients (for example, Microsoft Outlook clients). Perform the following steps once for the Exchange domain. The clients will access their mailboxes using RPC. They will connect to the FQDN of the RPC Client Access Array set on the mailbox database. The FQDN resolves to a Virtual IP address on the Load Balancer. In turn, the Load Balancer connects with one of the Client Access servers for each connection request. The load balancer must be configured to serve each of the CAS Servers. On the DNS Server, add an A record to the DNS zone that associates the VIP address with the FQDN. This is the address that will be used by the clients to connect to the Client Access server array. 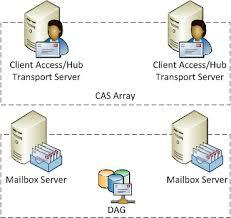 Using the Exchange Management Shell, enter the following command to create a new CAS array where cas.fhpaschen.com is the FQDN of the Client Access server array, and Default-FirstSite-Name is the Active Directory site to which the Client Access server array belongs. Ping the FQDN (e.g. Cas.example.com). The ping should fail because the Service has not yet been created on Load Balancer, but make sure that the domain name resolves correctly to the VIP address. You need to run the following commands to set the CAS for each database. At the time of installation the code is below, if new databases are created you would have to run that against those databases or adjust the code to include them.